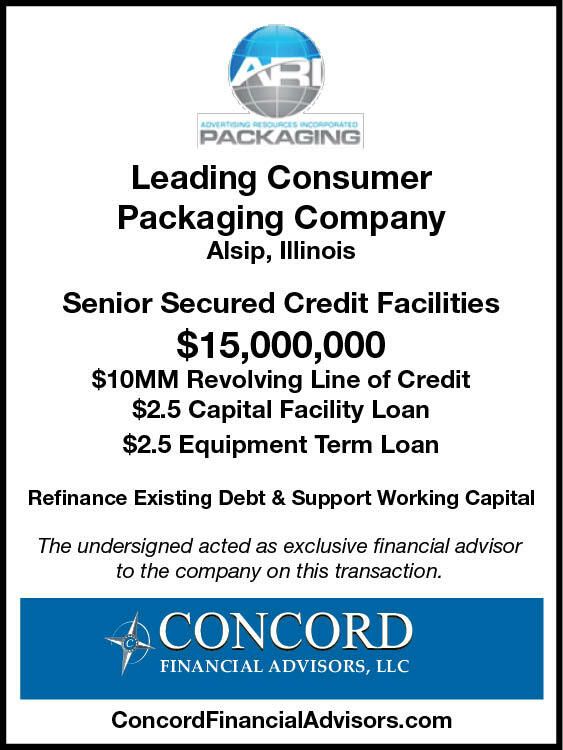 ARI Packaging, Inc. (Advertising Resources Inc.) is a 17-year-old consumer packaging company headquartered in Alsip, Illinois, with three other locations in the U.S. Early this year, the company’s bank determined that they were no longer a suitable fit for their portfolio and asked them to secure a new lender. Initially ARI Packaging searched for a new financing partner on its own. They met with 10 lenders and received two Term Sheets to consider. Neither offer was satisfactory to them. That’s when one of the lenders who respectfully declined the deal referred ARI Packaging to us. We stepped in and ultimately saved ARI Packaging countless hours in their search for a new lender. After completing our due diligence, we screened and qualified several lenders we knew to be appropriate for our client. One consideration was that ARI Packaging wanted to work with a regional bank. We identified a Chicago-based bank that was equipped to handle the loans and all cash management and treasury services for ARI Packaging. This bank liked the experience and expertise of the company’s ownership/management team, and they were impressed by their customer base, core business model and recent improvements in performance. The new financing through the bank provides ARI Packaging with the additional liquidity they need to purchase equipment and finance growth.